Create Ideal Temperatures. (Jacket only, Fast Ferment and Stand not included). The Insulated Jacket is a system that’s affordable & gets the job done to create ideal brewing & winemaking temperatures in the FastFerment. It works with the Wall Mounts & with the Stand. In hot climates, add 2L bottles of ice to cool it down, switching them out every 2-5 days. In cool climates, simply add a heating pad. - One frozen 1-litre bottle will result in a 2.5 degree F drop below room temperature. - One frozen 2-litre bottle will result in a 5 degree F drop over below temperature. - Two frozen 2-litre bottles will result in a 10 degree F drop below room temperature. - Three frozen 2-litre bottles will result in a 15 degree F drop below room temperature. For this test, 3 frozen 2-litre bottles were cycled every 24-36 hours. The FastFerment System is a one-stage fermenter, which allows brewers & winemakers to do primary & other stages (resting/settling) in the same unit before then transferring into kegs or bottles. 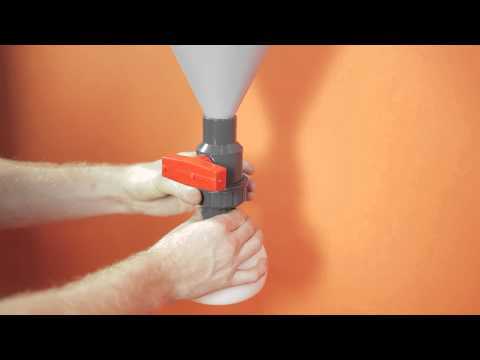 FastFerment eliminates racking & transferring between buckets & carboys. This saves up to 80% of the time & labour needed to make a batch of beer or wine compared to traditional methods. With less equipment, clean up is easy. Showing our 2 Fast Ferment - Conical Fermenter reviews with an average rating of Excellent. Would you like to write a review? Having purchased this fast fermenter and associated parts I found it a joy to use. It should be noted follow the procedures in the manual is must so you do not damage the threads. Having brewed using this fermenter I have since purchased another and all the associated parts. Well made piece of kit, only thing that let's it down is lack of a sampling tap. Ended up adding my own for a few quid. After fermentation, all the trub and yeast drops into the collection bowl and simply removed. Haven't bothered with the wall brackets and purchased the stand which makes life easier for filling and cleaning etc. Good purchase.